Housing Breitling Superquartz™ technology within its sleek stainless steel case and detailed tachymeter bezel, this Breitling timepiece from the Colt collection is an aviation instrument of the highest quality. Water resistant to 200m. 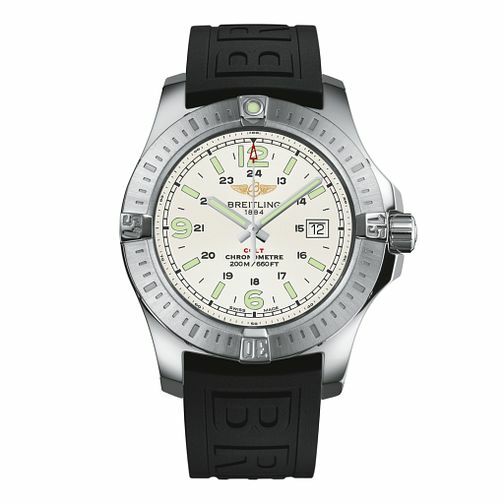 Breitling Colt Superquartz men's black rubber strap watch is rated 3.0 out of 5 by 1. Rated 3 out of 5 by Anonymous from Quality timepiece. Lovely clear and specific face and bezel. Illuminates nicely in poor/dark ambience. The strap is attractive and stands out. Five *. Excellent value for money. There really is nothing more to be said.